1. Coastal hiking with the Danish Heart Foundation, 10 June. I love it when Mary goes casual. I just do. 2. Revealing a new stamp for charity for the Danish Heart Foundation, 10 June, in such a fun skirt. I love this look. I love this week. Hold on tight, I'm in the mood to gush over Mary, apparently. 3. At a birthday party for the former Court Chief, 11 June. She looks ready to par-tay. 4. Visiting Glostrup Hospital, 13 June. 5. Attending the presentation of the European Inventor Award, 14 June. 6. The welcome ceremony for the Chinese president’s state visit to Denmark, 14 June. Such a pretty color combination, and one of my favorite hats to boot. 7. Dinner for the European Trade Organizations, 14 June. Fantastic detail on this repeated gown. 8. Visiting Rosenborg Palace with the President and First Lady of China, 15 June. 9. Gala banquet, 15 June. Jumpy claps! 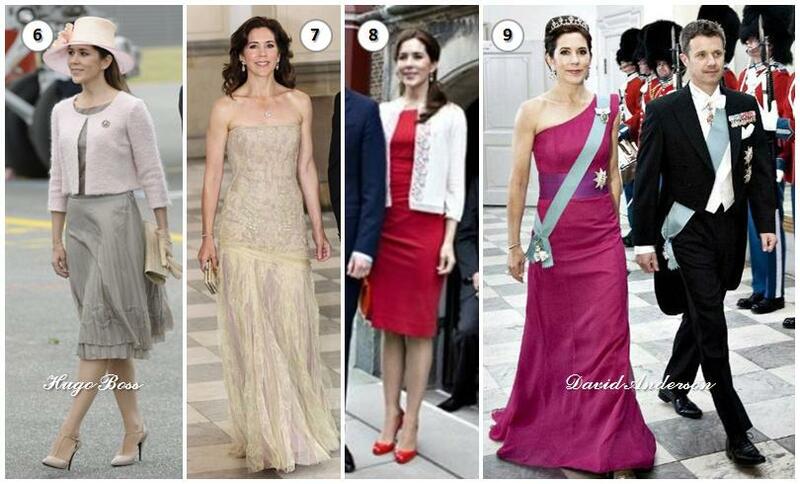 My favorite dress from 2011 and TIARAS! Bless. I've been feeling so deprived of tiara appearances lately, I just feel we’ve been in a drought. 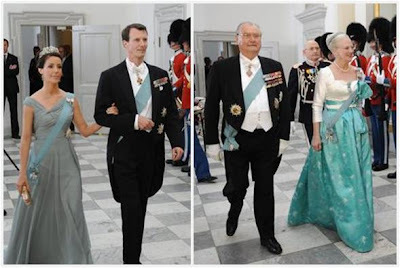 Nothing terribly surprising though, dress repeats all around and the usual turnout on the tiara front: Mary in her wedding tiara (her usual pick for an event like this), Marie in her usual floral tiara (ditto, and her only pick until we finally see her debut her second tiara), and Margrethe in the Turquoise Bandeau. The big news is that Marie finally has Margrethe's portrait brooch to wear! It's sort of like a royal family order (though not, technically), click here for more on those. Making it an even 8 grandkids must have done the trick.